ATHENS -- We all want to believe - need to believe - after the torrent of testosterone, THG, everything else. The chemicals have so saturated the Athens Games that one has to wonder: Even if they turned off the lights, would Olympic Stadium still glow in the dark? But really, you just can't be sure. Not anymore. Marion Jones walks through the stadium tunnel. Finished. Never contending in the long jump, a botched handoff in the relay. Once Sydney's darling, she will go home empty-handed - far removed from the otherworldly talent who in 2000 wrapped her arms around five medals, if not all of track and field. Say the right thing. Stay composed. 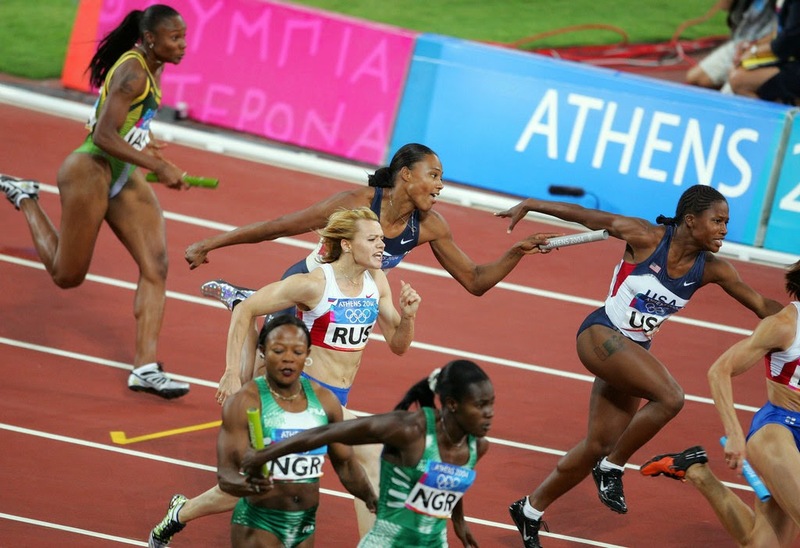 "I don't even know what happened," Jones says of her pass to Lauryn Williams, the baton switch that never was. "Angela [Williams] ran a good leg. I thought I ran a good leg. It didn't happen today." "It was a rough one." She turns. Wells up. Teammate LaTasha Colander places a sympathetic hand on her back. Jones strained to hand over the baton - once, twice, four times. "Wait!" she screamed. "Hold up!" Too late. Lauryn Williams was out of the exchange zone, started her run too soon, never gave Jones a chance. "[Williams] expected the drugged Marion, not the clean one," snickers a bystander. A cloud hangs over these Olympics, shaped like a syringe and spitting Stanozolol rain. Greek sprint stars Kostas Kenteris and Katerina Thanou pull out of the Games after reportedly faking a motorcycle accident to dodge a drug test. Officials later find 641 boxes of tainted supplements in a warehouse used by their coach. Russian shot putter Irina Korzhanenko becomes the first woman to win a gold medal at Ancient Olympia - and the first to have her title stripped for doping. In a single day, six weightlifters test positive. Two are yanked from competition just moments before their lifts. Then there's Jones. She can't even falter in peace and walk away without the whispers trailing. Not when the United States Anti-Doping Agency continues to probe. Not when the circumstantial evidence is so damning. Not when the puzzle pieces fit so neatly. The father and namesake of Jones' son, record-busting sprinter Tim Montgomery, is knee-deep in the BALCO mess. Charged with steroid use, he faces a lifetime ban. Jones' ex-husband, disgraced drug cheat C.J. Hunter, reportedly has told federal agents that he saw Jones inject banned substances before, during and after Sydney, and claims that he shot Jones up himself. And former Jones coach Trevor Graham? He's only the guy who turned in the dirty needle, the one that touched off the BALCO imbroglio. A man of principle? Nine of Graham's current or former athletes have been accused of or busted for doping. Do the math. Jones retorts she's never failed a drug test. That this is all the work of a jealous former husband, a jilted ex-coach. Maybe that's the case. But what does passing a drug test actually prove? Any expert will tell you: Only the stupid and the reckless get caught. THG was engineered to be undetectable; without Graham, it still would be. Victor Conte only knows what else is out there. Hard to find a drug you aren't even looking for. Jones looks softer now, more rounded, less superhuman. Perhaps it's only natural: she had a baby last summer. Or perhaps she's simply off the juice - the better to protect her child, the better to withstand recent scrutiny. Speculation runs rampant. Jones has made angry denials. Called USADA a kangaroo court. Challenged the agency to lay out its evidence in a public forum. But USADA won't take the bait. And heartfelt protests aren't worth the tissue paper they're blubbered on. Greek weightlifter Leonidas Sampanis wept, pleaded, swore on his two daughters that he was clean. He still was stripped of his bronze medal. Kelli White maintained her innocence to the very end, right up to USADA's two-year suspension. Jones could be telling the truth. She could be a good actor. A new generation of stars has emerged in Athens. Justin Gatlin. Jeremy Wariner. Shawn Crawford. Allyson Felix. They bill themselves as fresh, unsullied, here to burnish track's battered reputation. "I am a genuine, clean champion," Gatlin said after winning the 100-meter dash. "I go out there and do what I have to do. All sports are going to have drug-related negativity. We want to bring positivity back to the sport." Gatlin sounds sincere. He's also coached by Graham. Reporters gossip in the press lounge, rumors swirling like flushed pills. Everyone's a conspiracy theorist. Noted good guy Allen Johnson falls in the 110-meter hurdles semifinal, the second spill of his entire career. Someone asks: did he trip? Or was he looking to avoid a test? The whole sport is paranoid, looking for grassy knolls, seeing tunnels at the end of every light. Oliver Stone ought to direct. On the same night Johnson tumbles, Greece's Fani Halkia crushes the field in the 400 hurdles, running four seconds faster than she did just a year ago. Eyebrows arch in the stadium tunnel. "Can I plead the Fifth on that?" says America's Brenda Taylor. "She came out of nowhere to run an Olympic record? That's pretty amazing." At Halkia's subsequent press conference, the questions are all the same - variations on a familiar theme. "Greeks were born to be winners," Halkia says to hopeful applause. "They are born to be first. It's inscribed in our cells." That much is true: Something's inscribed in their cells, in the very DNA of the sport. But without a degree in molecular biology, who can say what? Jones. Halika. Everyone else. All of them suspects, fair or otherwise. In their endless deceptions and countless denials, track and field's drug cheats have left the cynics more right than they could possibly hope, the athletes guilty until proven innocent, the true believers clinging to the worst kind of faith. Blind.